Two Hour DVD transfers ONLY $18.95! IMC Studios' digital duplication service provides our customers with state of the art analog to digital conversion technology. 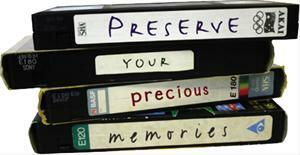 Our skilled technicians take great care with your precious family history to achieve a quality duplication. Get that box of videotapes out of storage and transfer them today! Call us today to schedule one or one-hundred videotapes! We even have special programs to fit large numbers of transfers into your budget. Our Digital Transfer machinery allows us to create quality digital recordings of many different analog videotapes, including one of the only digital cassette transfer systems in the area. 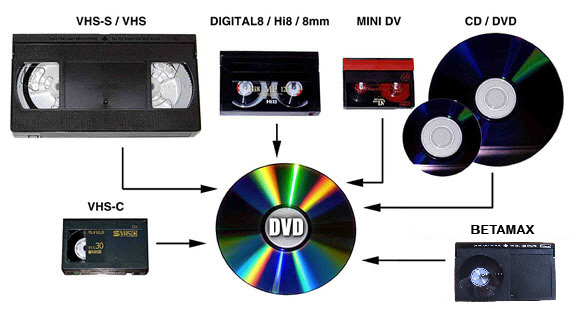 We're ready to convert a wide range of formats including VHS, S-VHS, Digital 8, Hi-8, 8mm, Mini-DV, CD, DVD, VHS-C, and BetaMax. One Copy in the Entire World? Do you have one and only one copy of a precious memory from your past? Is it stored on an older analog tape format that you don't even own a player for anymore? Remember: manufacturers are discontinuing the sale of videotape and videotape players every day. Don't be left without a way to view such important events from your personal history! Convert your older analog media today! One distinct advantage in working with IMC Studios is our ability to combine multiple tapes into one recording. Many of our customers have come to us due to this money saving feature. Rather than charging for every video regardless of length, we allow you to combine multiple tapes to fill the entire 2 hours of recording time. IMC is a Platinum Partner with Discmakers, giving us the ability to service 1 to 100,000 copies. Quantity discounts are available.